"Sid the Science Kid" is a cute preschool show from PBS Kids. 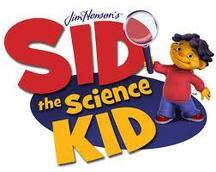 Sid the Science Kid helps children explore early childhood science concepts. Here are free printable life science, nature, earth science, chemistry and physics lesson plans for young children. Children color, draw and study everyday science concepts from the classroom, home, playground and kitchen. Check out the free printable Sid the Science Kid activities. Visit this link for a free printable 18 page booklet featuring drawing activities, coloring pages, lesson extensions, matching, counting and other science lesson plans. This free printable booklet makes an excellent follow-up lesson plans for any preschool science activities. Use free printable Sid the Science Kid lesson plans and preschool science activities to follow up on preschool science experiments of seed planting, nature observation health, nutrition and other basic science concepts. Children will enjoy making a color, cut and paste Weather Cube for nature study games. Try the Sid the Science Kid collection jar activities to teach children to learn how to look at things in their environment with a scientist's eye. Using chalk, a magnifying glass and a magnet, Sid guides students to explore objects and describe what they see. Visit Sid's homepage for more free preschool science activities on cooking, chemistry, health, nutrition, human body and much more. Preschool teachers, homeschoolers, parents, day care providers, be sure to check out the dozens offree printable Sid the Science Kid lesson plans, games, worksheets, charts, diagrams and activities. Each lesson is linked to an episode of Sid the Science Kid. Each of the science activities and worksheets gives content connections that will fit with most educational curriculum. Students can watch the show from this site and use the free printable science extensions for lesson plans. Check out the homepage for Sid's Science Fair apps, games and other preschool science activities. PBS in an industry leader in education, particularly preschool and early childhood. "Sid the Science Kid" is a perfect complement to any preschool science activities. For more free printable activities, visit Free Printable Lesson Plans.